It's about a lot more than the election. Shares of the Detroit automakers have had a tough ride in 2016. Year to date, Ford Motor Company (NYSE:F) shares are down almost 13%, while Fiat Chrysler Automobiles' (NYSE:FCAU) are down nearly 17%. General Motors' (NYSE:GM) shares are about flat for the year, but only because a sharp rally on Thursday and Friday erased its losses. Through this past Wednesday, GM's stock was down about 9% since the beginning of 2016. It doesn't seem fair. All three have reported strong profits in recent quarters. But investors have been worried about the U.S. new-car market, which accounts for the bulk of Detroit's profits -- and which is showing signs of slowing down. Strong truck and SUV sales have generated fat profits for Detroit over the last few years. Image source: Ford Motor Company. GM, Ford, and FCA are all global companies with huge operations around the world. But all three, more so than most of their global rivals, are still very dependent on profits in North America, most of which come from the United States. Data sources: the automakers' earnings reports. Chart shows adjusted pre-tax profits in North America (blue) as a percentage of overall pre-tax profits (blue plus green) for 2016 through Sept. 30. FCA's results have been converted from euros to U.S. dollars at a rate of 1 euro = $1.09. That makes the state of the U.S. new-car market very important to investors in the Detroit automakers. And as I said, there are growing signs that it may be past its cyclical peak. Auto sales are cyclical. Demand for new cars and trucks is closely correlated with consumer confidence, for reasons that are probably obvious: People and businesses hold off on buying new vehicles when they're concerned that their earnings are going to be squeezed. 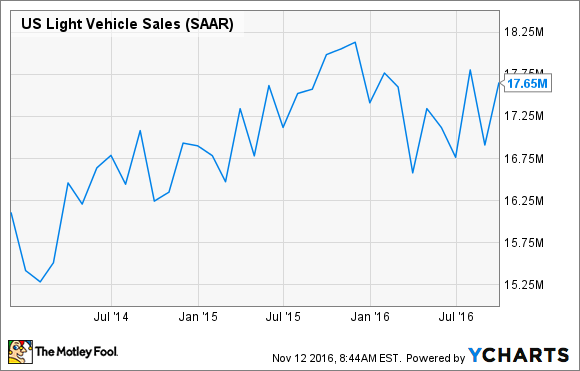 The pace of auto sales is tracked using a calculated statistic called the "SAAR," for "seasonally adjusted annualized rate." If we say that the SAAR for October 2016 was 17.65 million, it means that if the pace of auto sales we saw in October were maintained for a full calendar year, 17.65 million vehicles would be sold that year. There are several different calculations of SAAR. The most important one for our purposes is the one that shows the pace of U.S. sales of "light vehicles," meaning cars, pickups, and SUVs. This chart shows the SAAR for the past three years. The pace of sales can vary considerably from month to month, but the trend isn't too hard to see: While it's still very strong by historical standards, the pace of light-vehicle sales in the U.S. peaked late in 2015 and has fallen off since. This longer-term chart, showing mostly SAAR figures all the way back to the beginning of 2000, might make the picture more clear. U.S. light-vehicle sales plateaued from 2000 through 2006, fell off a cliff in 2008, and didn't really recover to pre-recession levels until 2014. They went a little higher in 2015 and have slipped back a bit in 2016. 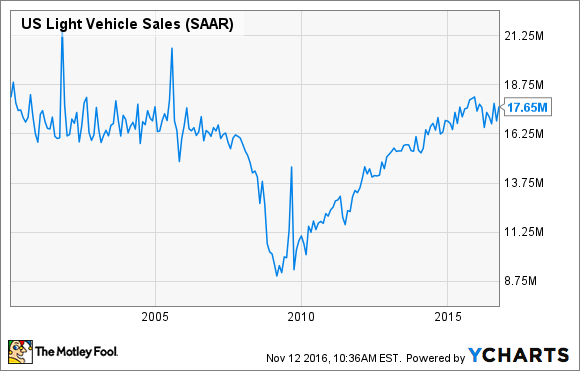 What does it mean if the auto sales cycle is past its peak? As last decade's data shows, if the economy is reasonably strong, auto sales can stay at a plateau for several years. That might be how things play out this time. But there are signs that automakers are starting to scrounge for sales growth by boosting their incentives. That's not an encouraging sign for investors, as rising incentives tend to eat into profit margins. There are other signs. Just in the past few weeks, both Ford and GM have announced production cuts. They were modest ones, but production cuts of any kind aren't something we'd expect to see in a growing market. For long-term investors, there's no reason to panic: A cyclical sales decline is normal and inevitable. But it's worth keeping in mind that as sales in North America taper off, profits at the Detroit automakers are likely to come under pressure for a while.